How Do Hockey Players Develop Confidence? Confidence is the belief in your ability and it can include two areas: (1) a general belief in your ability that you are one of the best players at your level; and (2) a task-specific belief in your ability to pass, shoot, play defense, stop pucks, etc. Confidence comes from many sources and it varies from person to person. Most athletes get confidence from one or more of the following: (1) past success, (2) experience, (3) performing well in the immediate past, (4) other persons, (5) practice, and (6) having a good support team. I recently talked with Dan Bylsma of the NHL Anaheim Mighty Ducks about success, confidence, and mindset needed to play hockey in the majors. Dan said that hard work, mental preparation, and the ability to handle the ups and downs of professional hockey are key ingredients to enhancing confidence and being successful in the majors. When playing as an amateur in the East Coast Hockey League, Dan kept a journal on his hockey performance. One day Dan wrote in his journal “I’m one day closer to the NHL.” Others knew of his dream and thought he was out of his mind to think this way, but Dan did not accept others views of his dream to make it to the NHL. He believed one day that it was possible to play in the NHL in spite of others who thought he was a fool to think that way. This says that it is very important to keep your dream alive in the face of criticism and adversity. Dan said the reason he made it to the NHL was because “I was focused on that goal of making it to the NHL, I believed I could make it, and I worked toward it in small steps.” Dan said that you have to believe you are capable of reaching your dreams and the belief comes from “day in and day out” working on improving your skills as a skater. When you work to improve each day, you start to believe and you start to become a better skater. “And when you take that to the game and start to see better results because you have trained, because you do believe, and because you are focused on it, then this is what spawns confidence and performance on the ice,” Dan said. 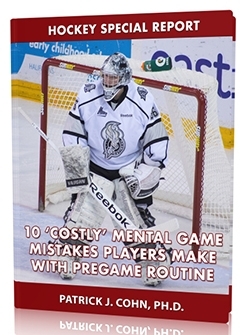 For NHL players, the mental aspect of the game becomes part of their normal preparation. 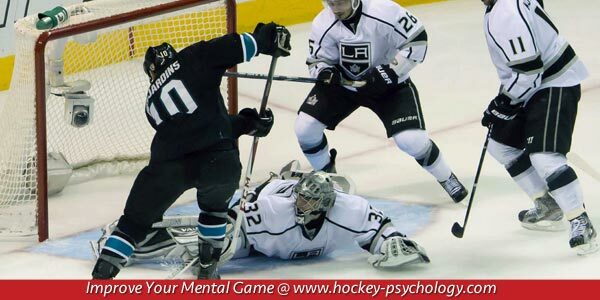 The use of superstitions, mental preparation, relaxation, focus, warm up routines, visualization, and anticipating game situations and being successful in game situations played out in an NHL player’s mind. All players at the NHL prepare mentally for games by reviewing their roles, visualizing situations, and knowing their jobs on the ice. This all leads to the concept I talk about with athletes called “preparing to be confident” and not leaving your confidence level up to chance or luck. The best players truly believe that because of their preparation and work in practice this separates them from everyone else in hockey.